 Welcome to Part Two of ReadWrite’s Raspberry Pi VPN server tutorial! 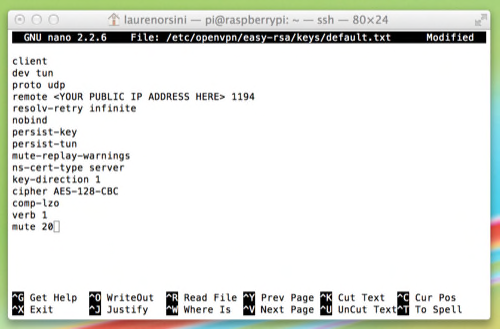 If you’ve followed the steps from Part One of this tutorial, you’ve got a fully functional VPN server on your Raspberry Pi. You can use this to connect securely to your home network wherever there’s an unencrypted wireless connection. You can also access shared files and media you keep stored on your home network. Next, we need to create the actual script file. The script will run from a shell file, which is an executable script that usually automates tasks on Linux—including in this case. As the script runs, it’ll ask you to input the names of the existing clients for whom you generated CA keys earlier. Example: “Client1.” Be sure to name only clients that already exist. The last thing to do is connect to your Raspberry Pi so you can download files from it. You need to use a SCP (Secure Copy Protocol) client in order to do this. For Windows, I recommend WinSCP. For Mac, I’ve been using Fugu. Okay, the hard part is over. From here, we need to input the scripts we generated earlier into a Graphical User Interface. For your PC, Android, or iOS mobile device, you can download OpenVPN Connect. There isn’t one for your Mac computer, so I tried both Tunnelblick and Viscosity. Tunnelblick is free, while Viscosity costs $9 after a free 30-day trial. In either case, let’s walk through how to set up a Mac computer as a client. In my case, my Mac is my fifth device that I want to connect to the VPN server, so the file I generated with the above script is named client5.ovpn. 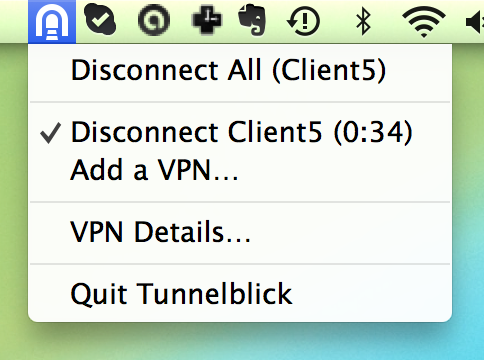 Download the version of Tunnelblick that works for your version of OS X. I’m using Mavericks, so I downloaded the beta. The fact that it popped up in a bunch of languages looked funny to me, but that’s the legitimate download. Then, it’ll ask if you already have a file you want to use. I did—my Client5.ovpn file. It will then ask if your configuration file is in .ovpn format or .tblk. If you select .ovpn, it’ll walk you through changing the file type to Tunnelblick’s native type. I did this by transferring Client5.ovpn into a folder Tunnelblick provided, and then changing the name of the folder to Client5.tblk. Now you’re all set to connect. 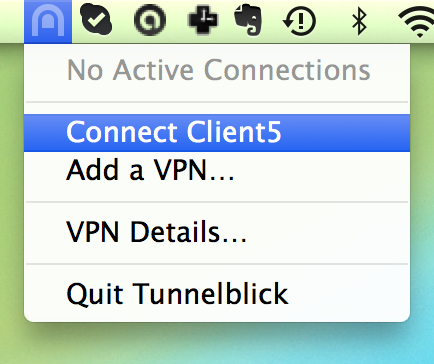 Click the Tunnelblick icon on the top right of your screen and select Client5. If you get the password right, it’ll look like this! Try out your new connection at coffee shop, the local library, anywhere there’s unencrypted Wi-Fi. You may still be using the public connection, but over VPN, your data is anything but out in the open.